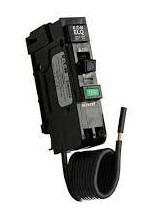 An alert has just come through from the Electrical Safety Office about a product recall on Eaton Quicklag ELQ Earth Leakage Circuit Breakers, which affects a large number of sites across Australia. The Eaton Quicklag ELQ has been very popular- and it is likely that you may have many of these throughout your installation. These can be identified by the green test button on the front. They have found a significant fire risk when the breaker operates during a short circuit condition. Eaton has offered replacement and fitting at no charge for the recalled units – visit the recall webpage for more details. Now is a good time to monitor your equipment and prevent faults, to reduce your risk of a fire being started from this switch gear. Make sure your equipment is test & tagged, cables are protected from damage and your workers know the process of extinguishing an electrical fire. If you need any help identifying your switchboards & gear at risk – or working through the recall – give us a call.